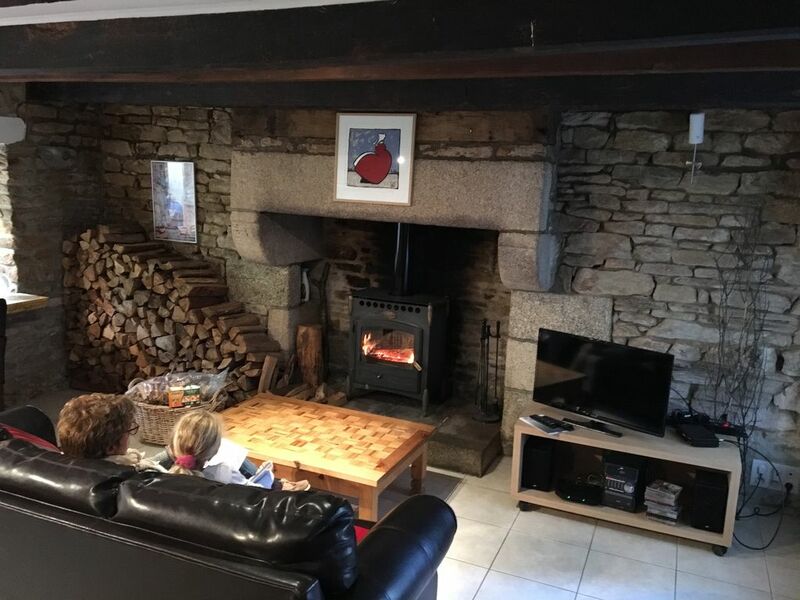 The cottage is located in the heart of the city of the painter in Pont Aven in a picturesque street away from the circulation..Le stay in the charm of old houses with wooden beams and a beautiful granite fireplace. Two spacious double bedrooms; each equipped with a shower and a toilet .The beds can be joined or separated. The kitchen is equipped with refrigerator, dishwasher, microwave and stove. From the kitchen you access to a beautiful courtyard where you can relax to the sound of the murmur of the river .... Of course the house is equipped with WiFi. We went for a week with our adult son to re visit an area were we spent many holidays a couple of decades ago. Normally we would stay somewhere more rural but I liked the look of the house in Pont Aven and it didn't disappoint. Both bedrooms were en suite and the one at the top of the house where my husband and I slept was beautiful with a vaulted ceiling. We went to sleep each night with the sound of the stream running past the back of the house and it was very relaxing. The house was well equipped and furnished with lots of little decorative touches. As there is no parking at the house the owner arranged for us to rent a lock up garage for the week that was an easy walk up the hill. We appreciated this. It was also an easy walk to the boulangerie, some lovely restaurants, art galleries, the museum and the river. Das Häuschen ist wie beschrieben, hat sogar eine Waschmaschine und zwei Badezimmer mit Toilette (eines mit Badewanne, eines mit Dusche). Die Vermieterin ist sehr freundlich, ungemein hilfreich und hat viele gute Tipps für regionale Aktivitäten und Restaurants parat. Merci pour votre appréciation enthousiaste. Ce fut un réel plaisir de vous recevoir dans notre maison de Pont Aven et de vous conseiller sur les nombreux sites et activités proposés aux alentours. Au plaisir d'une prochaine rencontre dans notre beau village !!! Sehr zentrale Lage, stilvoll eingerichtet, es fehlt an nichts! Das Haus liegt in der zweiten Reihe zu einer Hauptstraße unweit des schönen Zentrums von Pont-Aven! The house is equipped to an extremely high Standard. All the appliances are in good working condition. The owners have given it some thought i.e. matching colours throughout the place. In General: a truely recommendable place!!! Das kleine Stadthaus geht über 3 Etagen und ist hübsch und liebevoll eingerichtet. Leider konnte der frische Minzduft den modrigen Grundgeruch nicht überdecken. Raumentfeuchter und Heizungen helfen nur, wenn man sie verwendet und nicht wartet, bis die Steckdose direkt daneben schon total schimmelig ist. Die Luft war unten so muffig und in der einen Ecke der Schimmel an der Wand leider schon kniehoch, daß wir die Koffer nur rein und dann wieder rausgetragen haben. Die beiden oberen Stockwerke waren gut, aber da wir unsere Urlaubswoche auch in Küche und Wohnzimmer verbringen wollten, haben wir uns eine neue Unterkunft gesucht. Generell ein hübsches Haus und in einem schönen Ort, aber nichts für empfindliche Nasen, Asthmatiker oder Allergiker. Nous sommes vraiment désolés à la lecture de votre avis. Au bord de la rivière, elle est construite avec d’épais murs de pierres apparentes et une très grande cheminée en granit dans le séjour. Il est vrai qu’en 2015, il y a eu, à l’occasion de très fortes pluies, une très légère infiltration d’eau sur le pignon ouest, mais vraiment rien d’important. Bien sûr, nous souhaitons garder le caractère authentique de notre cottage, c’est pour cela que les estivants viennent chez nous ! Ils apprécient leur séjour dans cette jolie maison et nous recevons beaucoup de compliments. Malheureusement, le charme de l’ancien peut ne pas convenir aux personnes très sensibles aux allergies ! Nous espérons toutefois, que vous garderez un bon souvenir de notre belle Bretagne, même si elle est parfois un peu pluvieuse.